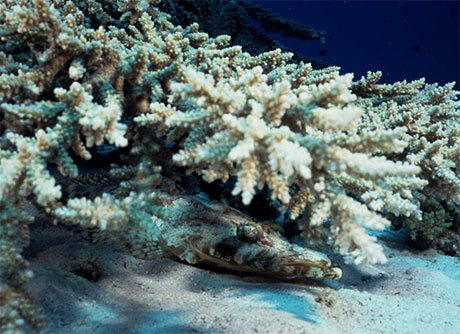 Also known as the Carpetflathead, the Crocodilefish lives on sand and rubble near coral heads – although you might also find it in patches of seagrass. A widespread species, it ranges from the Red Sea to Durban, to the Seychelles and Madagascar. You may also come across it in the Mediterranean, where it is has entered via the Suez canal. Look out for it at quite shallow depths: between 1 and 15 m.
The flatheads are flattened fishes. They have two dorsal fins and bony ridges and spines on their heads. The body is mottled above, whitish below. The crocodilefish grows as large as 70 cm. It is a very placid fish which, confident in its camouflage, lets you approach closely. Although related to scorpion fish it is harmless.